A week or so ago, I saw this on the “Being Liberal” Facebook page, and loved it. This is what made me late to my son’s orthodontist appointment. Why traffic was so slow. Inspired by the “Being Liberal” picture at the beginning of my post, in the waiting room I borrowed a sharpie and a blank piece of paper. After the appointment, I parked in the next parking lot over from this truck and told my son to stay in the car. Then I approached the truck and began taking pictures of it. My legs were shaking for some reason, but I couldn’t figure out why. Maybe it was from anger, maybe it was from fear (anyone who drives this around and parks it on a main street can NOT be right in the head.) No one was in the truck, to my great relief. I planned to leave my sign on the windshield, but I noticed the window was open a smidge. (It’s August. 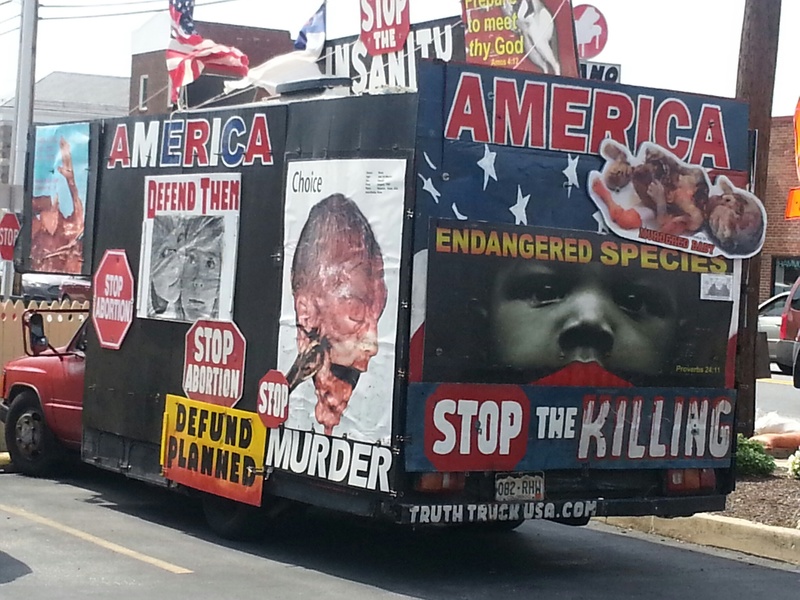 Can’t let the “spread-the-vicious-hate-mobile” get too warm on the inside.) Even better. I slipped my sign through the window, and it landed between the two front seats. I wish I had taken a picture of it before I sent it through the window, but here it is. I know, I know, I could have also mentioned being an abortion-rights supporter. I figure that can be assumed. And that this particular message would gross them out even more. So, there it is. I have, on occasion, been accused of having balls of steel. Today, I agree. Cross-posted with permission from The Worthington Post. 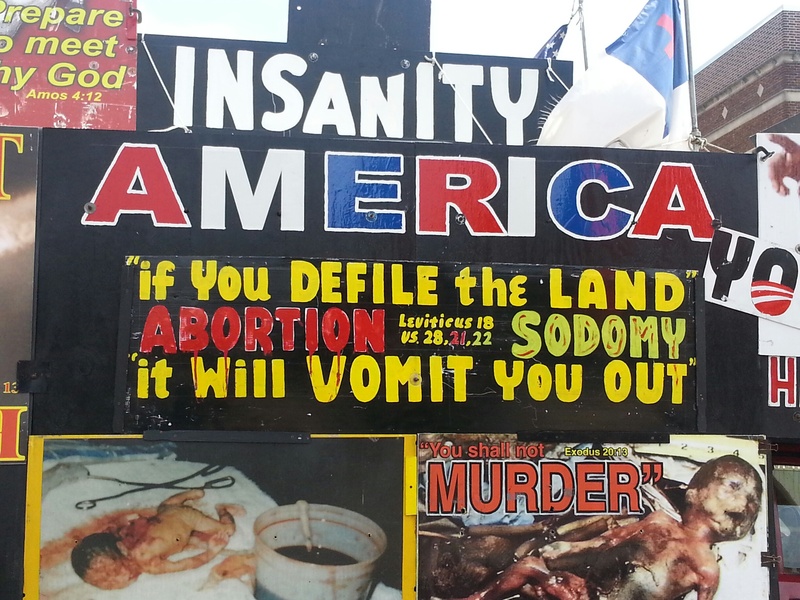 I am a pro-life supporter who does not believe in displays such as this for many reasons. 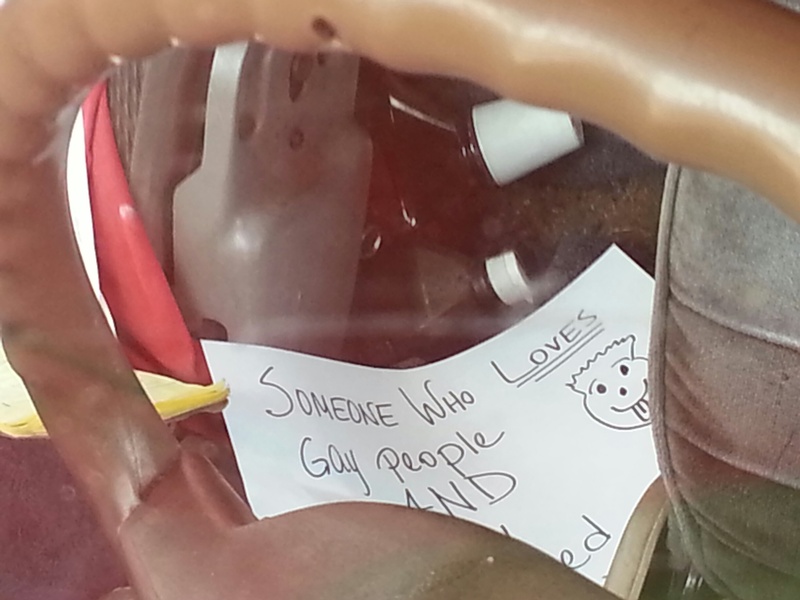 However, I think a note explaining your objection to the display would have been more productive than one that assumes that the stereotype you have of the sort of person who would drive that truck is true. Have you ever heard of these folks? http://www.plagal.org/ (Pro-life Alliance of Gays and Lesbians) Being gay doesn’t equal being pro-choice and being pro-life doesn’t equal hating homosexuals. I have been known to leave my website business card about the long term negative affects of adoption relinquishment on cards in parking lots with anti abortion bumper stickers. Not all the time, but almost ALWAYS if they have some sort of pro-adoption message. I am so proud of you for speaking MY mind.